While reheated fried chicken isn’t quite as good as freshly fried, it’s still pretty good. We served with a Taylor Farms Avocado Ranch Salad kit. The salad kit was $3.00, but we’ll get four serves, or 75c per serve. Not a bad lunch for $3.55 per serve. For dinner Foodie Greg tried a new recipe: Sausages with Lentils. We used the Feta, Spinach Turkey sausages from our Keller Crafted box, and French lentils. Add 35c for the other ingredients. This wasn’t Foodie Philip’s favorite. While the sauce alone was a little salty, combined with the somewhat bland lentils, it was reasonably balanced for $3.90 per serve. We were holding the remaining Popeye’s for Sunday lunch, so today we reverted to toasted sandwiches. One with sliced turkey breast, sun dried tomato spread and Swiss, the other with Sweet & Spicy Tuna, capers and Swiss. Add 40c for butter, and sun dried tomato spread. Lunch was pretty decent for $2.06 per serve. 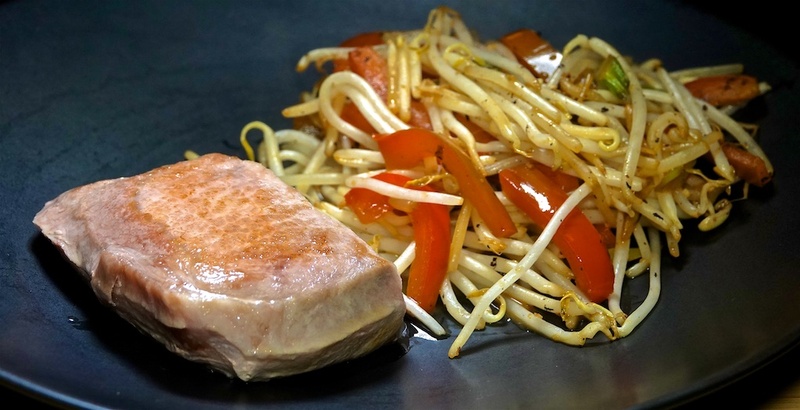 We souse vidé two dry aged pork chops to just short of the recommended temperature, and the did a quick sear in the high tech, non-stick wok. They turned out as well as they did last time – great! We served with stir fry bell peppers and bean sprouts. Add 25c for dressing ingredients. A very good meal for $13.33 per serve. As we’re having vegetarian tonight, we went “fishy” at lunch with canned smoked tuna. 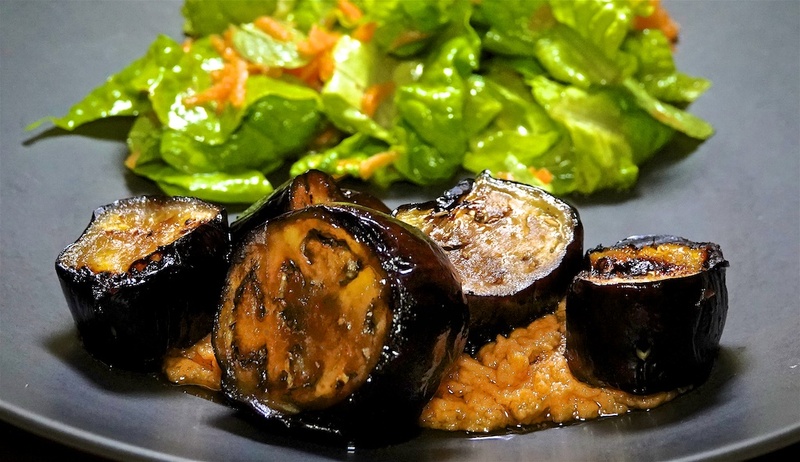 We over-catered with the grilled eggplant, so we had leftover. Add some more peanut satay sauce and a very inauthentic Vietnamese inspired salad. The bean sprouts were $1.49 and we used half, or 38c per serve. It was worth braving the cold weather to grill outdoors because this is a great meal for $2.55 per serve, although we have learnt that reheating slightly enhances the texture, so perhaps next time we’ll grill in the day when it’s warmer and reheat for the meal. Foodie Philip was passing Popeye’s on the way home, so why not pop in and pick up some dark and spicy fried chicken. Thursday night is traditionally our steak night, so tonight we defrosted a 10 oz rib eye from Keller Crafted and prepared it in our (new) high tech, non-stick wok. On the induction cooktop we can directly set the temperature, and we get a really good, quick sear on the outside. We served with a home made Caesar Salad with home made dressing. Baked cheese bites (substituting for croutons) are $2.69 for a pack and we shared half, or 67c per serve. A fairly simple meal, but when everything is of high quality, the meal becomes something special for $9.18 per serve. For lunch we stuffed a heated panini roll with egg salad and watercress. The watercress cost $1.96 and we shared about 1/8 or 13c per serve. For dinner we sliced the other half of the Greek Style with Spinach and Feta meatloaf and fried them to give them a nice crust and to reheat. We served with tabouli and dolmas. The meal was equally enjoyable for $8.89 per serve. The panini roll is 63c. Definitely a sloppy sandwich, but tasty for $2.70 per serve. 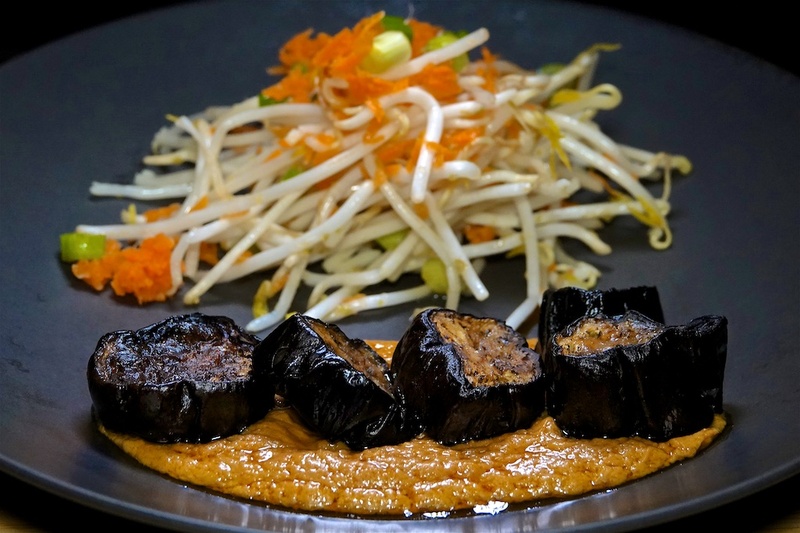 Our guests tonight had some dietary restrictions so we went vegetarian with grilled eggplant, peanut satay sauce and a very inauthentic Vietnamese inspired salad. The lettuce was – ironically – a gift from one of our guests a couple of days earlier. It was worth braving the cold weather to grill outdoors because this is a great meal for $2.17 per serve. Today was a repeat of Saturday! For lunch we heated some par baked rustic panini rolls and stuffed them with reheated pulled pork. The pulled pork in a hot, crunchy roll makes a perfect cold weather lunch for $2.72 per serve. Since it has about ¾ ounce of meat per serve, the Mushroom and Farro Soup from Saturday is close to “meatless Monday.” A little of the freshness of the sherry had softened but it was still very good for $3.17 per serve. We were uninspired at lunch, so we reverted to toasted sandwiches. One with sliced turkey breast, sun dried tomato spread and Swiss, the other with Lemon Pepper Tuna, capers and Swiss. While we have our favorite meatloaf recipes, this Greek Style with Spinach and Feta, was definitely interesting enough to try. We will get four very generous serves from this meatloaf. 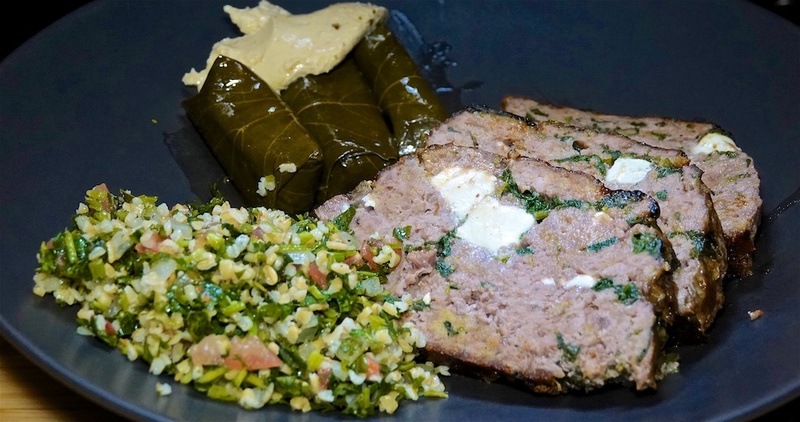 We served with prepared dolmas and tabouli. Tabouli was $2.69 and we used about ⅔ or 90c per serve. This was a really good meatloaf. The lemon permeated it without dominating and the feta bought texture variation and salt. We’ll do this one again at $8.89 per serve. For lunch we heated some par baked rustic panini rolls and stuffed them with reheated pulled pork. The only real positive about Winter are soups and stews! Foodie Greg found a new ‘creamy’ mushroom soup that seemed interesting, particularly since we still had farro on hand. The recipe makes six serves. 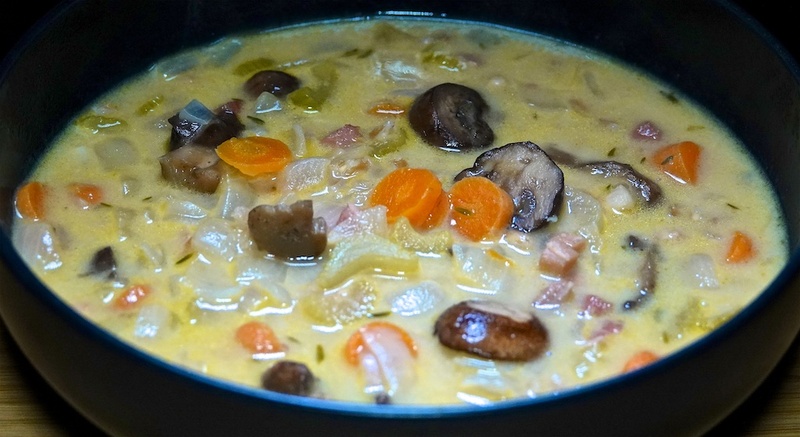 We had to substitute crimini mushrooms for wild, and our pancetta was more finely diced than the recipe called for, which turned out to be a positive. As it was the same size as the farro, which has a similar texture, the two became indistinguishable, giving the effect of a lot more meat. Add 20c per serve for other seasonings. This is a very good mushroom soup. The addition of the sherry/marsala (which would be better) at the end elevates the whole dish. The butter and cream fraiche brings the creamy texture without a lot of dairy. We were surprised how meaty this was, because of the interchangeability of the pancetta and farro. A really good soup for $3.17 per serve. A cold miserable day calls for a nice meat pie. Probably calls to Aussies stronger than Americans, but we do like a pie! Foodie Greg had Trader Joe’s Chicken Balti, while Foodie Philip had the Steak and Stout. Trader Joe’s pies are $6.49 for two or $3.25 per serve. Since our hot smoked salmon was so successful last week, we smoked cod (frozen fillets) and served them with a brown rice kedgeree. 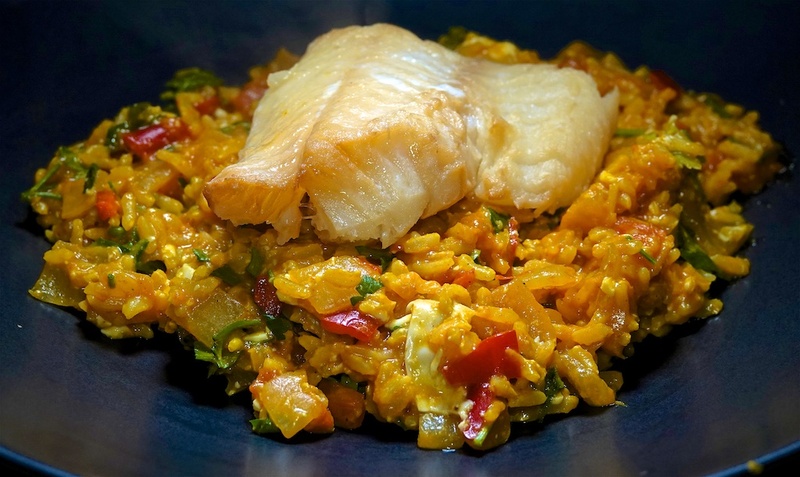 This is a more traditional kedgeree rice and is served with the cod. Add 55c per serve for ginger, onion, curry powder, ghee and seasoning. While the kedgeree had more heat than our normal recipe, it was a good variation with more intense flavors. The hot smoked cod was perfectly cooked and took up good smoke flavor and color. Another good meal for $4.69 per serve.